While hydropower development has potential benefits, it also brings about enormous costs. 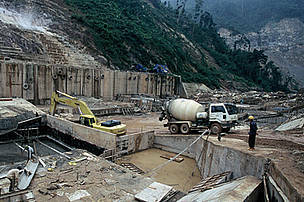 Hydropower dams fundamentally alter the river ecosystem, often with negative impacts to livelihoods and biodiversity. 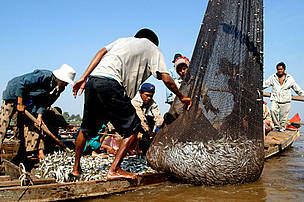 Failure to adequately account for, and address the impacts and uncertainties associated with hydropower projects on the lower Mekong River, particularly concerning fisheries and sediment flows, could have severe consequences for the livelihoods of millions of people living in the Mekong River basin. This is the challenge that WWF is taking on. Eleven Memoranda of Understanding have been signed for the construction of hydropower dams on the lower mainstem of the Mekong River. The decision to construct just one of these dams carries with it permanent consequences for the Mekong’s biodiversity, fisheries and people. WWF is urging the governments of the Mekong countries to agree to a 10-year deferral on making a decision for hydropower projects on the Mekong mainstem. This will allow for a comprehensive cost-benefit analysis of their construction and operation. 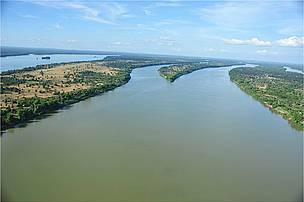 WWF is also advocating for Mekong countries to establish an environmental master plan for the Mekong River, to help ensure sound and effective decision-making and use of the Mekong’s water and related resources for development, while protecting the environment. Such a master plan will require a solid baseline. Without it, it is difficult to plan for future changes to an ecosystem. A baseline is not a list of sub-elements of the ecosystem, it is a demonstration of the understanding of how they operate together as “functional units”; and this includes what are the roles of flows (water, sediment and nutrient) and connectivity. In collaboration with the Mekong River Commission, governments agencies of the Greater Mekong region, the hydropower industry, and local people, WWF is helping to improve the planning, design and operation of dams. We’re advising on the design and operation of hydropower dams in order to provide the best development opportunities at the least cost to the local environment, people and economies. Sound science: Carrying out comprehensive, science-based studies on the impacts of mainstem hydropower projects on the Mekong River, in collaboration with partners and experts. The results of this analysis are used to inform and influence political decision-making on such projects. Smart financing: Engaging financial institutions to ensure they understand the investment and reputational risks associated with unsustainable dam developments, and that they preferentially invest in sustainable projects. Alternatives: Promoting alternatives to mainstem hydropower dams with sustainable hydropower on selected Mekong River tributaries. Standards: Promoting development standards to ensure more sustainable planning, design and operation of hydropower projects, including the Hydropower Sustainability Assessment Protocol, Rapid Basin-wide Hydropower Sustainable Development Tool (or RSAT), and the International Hydropower Association protocol. The Mekong Delta coast line is eroding fast, in contract to the seaward expansion of the delta over the past 6,000 years. This is a result of both reduction in sediment carried along by the Mekong River, and increase in storms and waves from climate change. WWF is providing both scientific assessments and policy solutions to address this difficult challenge. As part of our Community Fisheries Programme, local fishing communities are working with WWF to develop and implement management plans to protect the health of rivers and the species that live in them, while still making a living from the ecosystem. These plans often allow fishermen to make more money, while providing long-term food security for communities all over the basin. "WWF supports a 10-year delay in the approval of lower Mekong River mainstream dams to fully consider the costs and benefits of their construction and operation." What are the environmental challenges related to hydropower development in the Greater Mekong area?